بحران منابع آب به‌دلیل روند رو به رشد مصارف آب به‌ویژه در کشورهای در حال توسعه، از اهمیت زیادی برخوردار است و چشم‌انداز تولید و دستیابی به امنیت غذایی را در این کشورها به‌شدت تهدید می‌نماید. تجارت آب مجازی به‌عنوان راهکاری جهت غلبه بر بحران کمبود آب به‌ویژه در مناطق خشک و نیمه خشک مطرح بوده و بر پایه تأمین آب مواد غذایی مورد نیاز از خارج از محدوده و وارد نمودن مواد آب بر از بخش‌های دارای آب کافی است. با توجه به اینکه بخش صنعت در حال حاضر به‌عنوان پایه توسعه استان زنجان مطرح شده است، لذا مطالعه حاضر با هدف تجزیه و تحلیل تجارت آب مجازی در بخش صنعت استان زنجان انجام شد. برای انجام این پژوهش از اطلاعات طرح آمارگیری از کارگاه‌های صنعتی ده نفر کارکن و بیشتر مرکز آمار ایران برای سال 90-1389، استفاده شد. ضمن دسته‌بندی صنایع، نیاز آبی و تولیدات این صنایع، میزان آب مورد نیاز آنها تخمین زده شد. نتایج نشان داد که بیشترین محتوای آب مجازی استان زنجان به صنعت تولید زغال کک و پالایشگاه‌ها، صنعت تولید کاغذ و محصولات کاغذی و صنعت مواد غذایی و آشامیدنی به ترتیب با میانگین 70/32، 14/26 و 63/11 مترمکعب بر میلیون ریال، اختصاص دارد. همچنین میزان کل صادرات آب مجازی بخش صنعت استان زنجان، معادل 10/3 میلیون مترمکعب برآورد شده است که 50 درصد آن به فعالیت تولید فلزات اساسی اختصاص دارد. یافته‌های تحقیق بیانگر آن است که استان زنجان در بخش صنعت در مجموع صادرکننده خالص آب مجازی است. Water crisis is of utmost importance due to the growing demand and consumption of water, especially in developing countries where its production and food security are facing serious challenges. Virtual water trade has been proposed as one strategy to combat the water scarcity crisis in arid and semi-arid regions. The strategy is based on the import of food and water-intensive supplies from neighboring regions that enjoy adequate supplies of water. Given the fact that the industrial sector has been proposed to serve as the basis of development in Zanjan Province, the present study was conducted to investigate the virtual water trade by the industrial sector in this province. For the purposes of this study, data from the statistical period 2010-2011 were obtained from the Statistical Center of Iran on enterprises employing ten member staffs or above. The data were used to categorize the industries surveyed, their water demands, and products to estimate the quantities of water needed for their continued operation. It was found that the highest quantities of virtual water in Zanjan are allocated to coking and petroleum plants, paper and cellulosic industries, and food and beverage processing factories with average values of 32.70, 26.14, and 11.63 cubic meters per million Rials, respectively. In addition, the total amount of virtual water exported from the industrial units operating in Zanjan Province is estimated at about 3.10 MCM, 50% of which belongs to base metal production. Conclusion: Our findings show that the industrial sector in Zanjan Province is a net exporter of virtual water. Allan, J.A., 1993, "Fortunately there are substitutes for water otherwise our hydro-political futures would be impossible", Priorities for Water Resources Allocation and Management, ODA, London, 13-26. Blackhurst, M., Hendrickson, C. & Vidal, J., 2010, "Direct and indirect water withdrawals for U.S. industrial sectors", Environmental Science and Technology, 44, 2126-2130. Chapagain, A. K. & Hoekstra, A. Y., 2004, Water footprints of nations, value of water research, report, UNESCO-IHE value of Water Research Report. Series No, 16. Dehghan Manshadi, H.R., Niksokhan, M. H. & Arestani, M., 2013, "Estimates of virtual water in water basin and their role in water transfer between basins", Journal of Water Resources, 6, 101-114. (In Persian). Deisenroth, D. & Bond, C.A., 2010, "The economic contribution of the private, recreation based aquaculture industry in the Western United States", Department of Agricultural and Resource Economics, Colorado State University. Faramarzi, M., Yang, H., Mousavi, J., Schulin, R., Binder, C.R. & Abbaspour, K.C., 2010, "Analysis of intra-country virtual water trade strategy to alleviate water scarcityin Iran", Hydrology and Earth System Sciences Discussions, 7, 2609-2610. Khosravi, Z., 2011, "Study of virtual water trade using input - output table", MSc Thesis, Department of Agricultural Economics and Development, Tehran University. (In Persian). Kuishuang Feng, Y. L. S., Guan, P. & Habacek, K., 2011, "Assessing regional virtual water flows and water footprint", Applied Geography, 32, (2), 691-701. Mohammadi Kanigolzar, F., 2012, "Water management based on virtual water trade in the products of the country", MSc Thesis, Department of Agricultural Economics and Development, Tehran University. (In Persian). 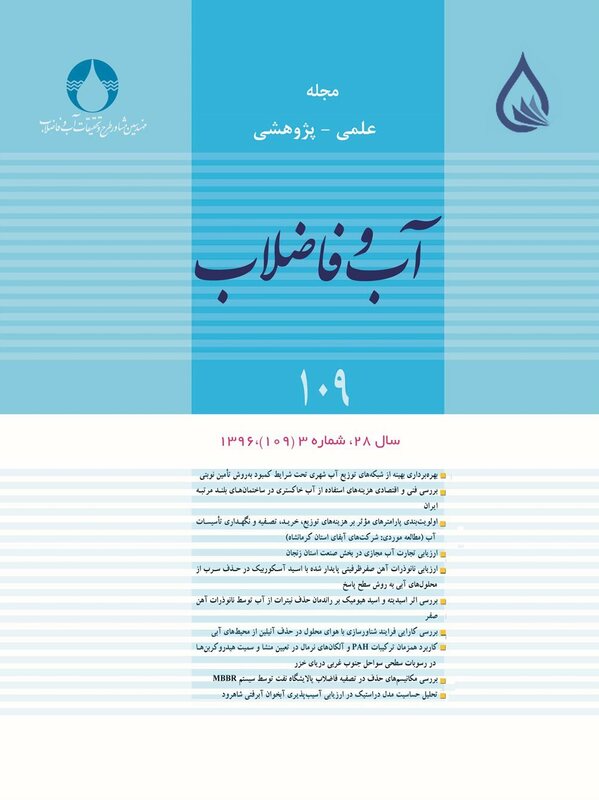 Mohammadi, H. & Taalimoghadam, A., 2011, "Virtual water trade for major agricultural products in Iran", The Second National Conference Preceding Studies of Iran Water Resource, Zanjan. (In Persian). Mohammadi, H., 2012, "The effects of trade liberalization on the well-being of consumers and producers of agricultural products, exchange of virtual water and sustainability: A case study in Fars province", Agricultural Economics, 6(3), 176-145. (In Persian). Office of Management and Budget, 2011, A land use plan of the Zanjan province, Tehran, Iran. Salah, A., 2014, "The pattern of virtual water trade in economic activity Gilan province of Input - Output table spread water", Master's Thesis, School of Economics, Shahid Beheshti University. (In Persian). Shekari, F. & Kokabee, A. M., 2013, "Management of water resources by modifying the virtual water consumption patterns in industry (case study area Ardebil)", Fifth Conference on Water Management in Iran, Shahid Beheshti University, Tehran. (In Persian). Statistical Center of Iran., 2008, The classification of economic activities in Iran, Tehran, Iran. Zhao, X., Yang, H., Yang, Z., Chen, B. & Qin, Y., 2010, "Applying the input–output method to account for water footprint and virtual water trade in the Haihe River basin in China", Environmental Science and Technology, 44, 9150-9156.